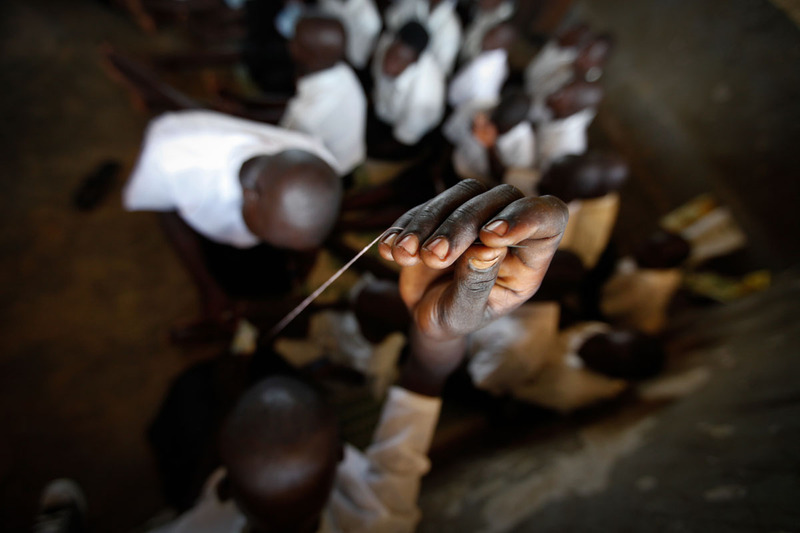 Pregnancy, poor health, poverty, absenteeism and drugs among others have over time formed the core of school drop outs in the Sub-Saharan Africa. 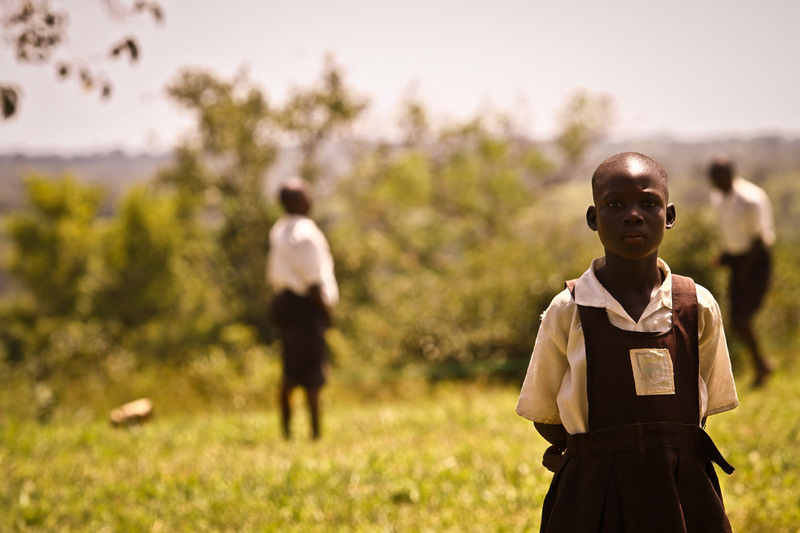 In Uganda, often ignored is the beginning of menstruation among school-going girls. Due to a lack of sensitization, many girls are caught in shock of new changes forming within them. Piloya Caroline displays a sanitary pad she handmade on one of the several days she has been involved in the project. Awere Primary school, 80km northeast of Gulu town started the project of hand making sanitary pads to keep girls at school. They are often left scared, hopeless and confused. Ignorance about this change has not helped their cause as many have fallen victims of intimidation and bullying in school by their peers. A girl pays attention during a hands-on practical class of making sanitary pads. Awere Primary school, 80km northeast of Gulu town started the project of hand making sanitary pads to keep girls at school. For the unlucky not sensitized about this sudden development, their dreams have been shuttered after opting out of school. A girl hand makes sanitary pads. Awere Primary school, 80km northeast of Gulu town started the project of hand making sanitary pads to keep girls at school. 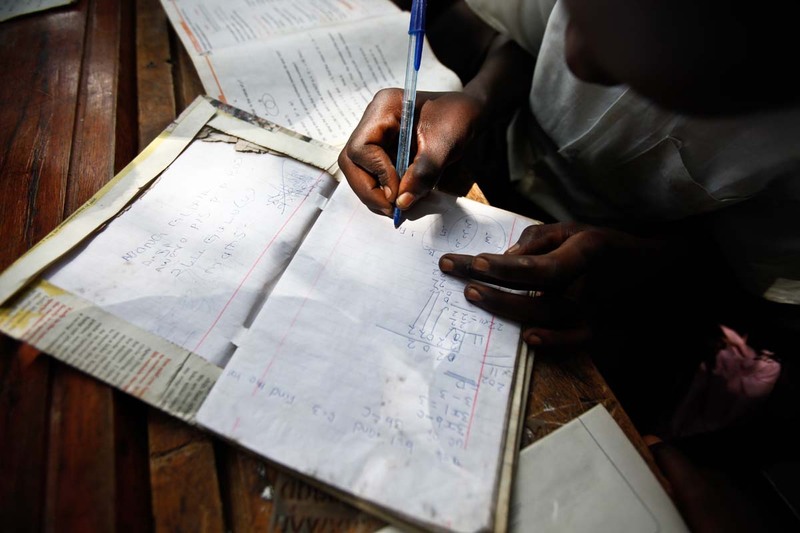 According to a 2010 UNESCO report, a continuous failure to complete a basic cycle of primary school has limited future opportunities for children which in turn has resulted into a significant drain on the limited resources that countries have for the provision of primary education. 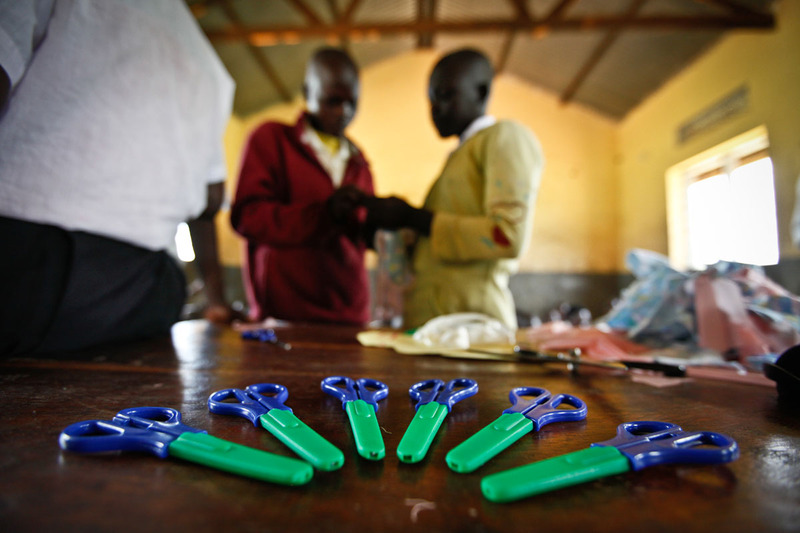 From ordinary tools such as scissors and needles, girls of Awere have been equipped enough to make sanitary pads. Awere Primary school, located 80km northeast of Gulu town started the project of hand making sanitary pads to keep girls at school. kindergarten) in 2009 completed their primary education. The pupils of Awere usually make pads in pairs. This has helped in quickening the process where each is expected to make at least four in every sitting. Awere Primary school, located 80km northeast of Gulu town started the project of hand making sanitary pads to keep girls at school. However, about 410km, north of Kampala, Uganda’s capital in a remote village of Ajan is a glimpse of hope in Piloya Caroline. The 14 year old 5ft and dark primary six pupil of Awere Primary School was fortunate to have been told about developments every girl is supposed to go through by her mother. After the practical, the pupils are then taught how to place the sanitary pads. Awere Primary school, located 80km northeast of Gulu town started the project of hand making sanitary pads to keep girls at school. “The first time of my period, I was not scared because I knew if you are a girl you must see your periods months after months after months,” Piloya said. Despite possessing this knowledge, Piloya’s troubles were not over as her parents could not afford proper high quality sanitary pads. “I did not even know what sanitary pads looked like,” Piloya recalls. Piloya says, her mum bought toilet paper rolls and taught her how to use them whenever her periods came. She recalls how discomforting that experience was. “During such times, it was hard to be at school because I could not play again like my friends. And also the toilet paper used to get wet and start falling down which was shaming,” She confesses. Piloya Caroline says, she can now play with confidence with her friends unlike the time she used toilet papers. What better way to prove that than actually joining the girls? Awere Primary school, located 80km northeast of Gulu town started the project of hand making sanitary pads to keep girls at school. Call it good timing, 2008, the time Piloya begun getting her periods was the time Awere Primary school starting a project of making handmade sanitary pads out of local cheap materials to keep girls at school. Girls like these, if not sensitized about menstruation have lost concentration in class leading to a reduction grades. Worse still, some have dropped out of school. ? Awere Primary school, located 80km northeast of Gulu town started the project of hand making sanitary pads to keep girls at school. Her discomfort was so evident that it gained the attention of Aduro Joyce, a senior woman teacher who is spearheading the handmade sanitary pads project. “I have dealt with many of these young girls before and I can always tell from their faces and interaction with other students. They try to be anti-social, “Aduro Joyce said. ”], this bell during her periods meant less to her.”] Since 2008, Awere pupils have attended a class every Monday and Thursday to learn how to make and use these sanitary pads. A pupil of Awere climbs a tree to during break time. Awere Primary school, located 80km northeast of Gulu town started the project of hand making sanitary pads to keep girls at school. Piloya is one of many in her class who are encouraged to be open to their teachers so that they can easily access school made sanitary pads. Piloya Caroline makes calculations of the sanitary pads she was tasked to make. Awere Primary school, located 80km northeast of Gulu town started the project of hand making sanitary pads to keep girls at school. “I feel very comfortable when am using these pads we make here at school because, now I can play with my friends without fearing anything. My life is easy now,” Says Piloya. 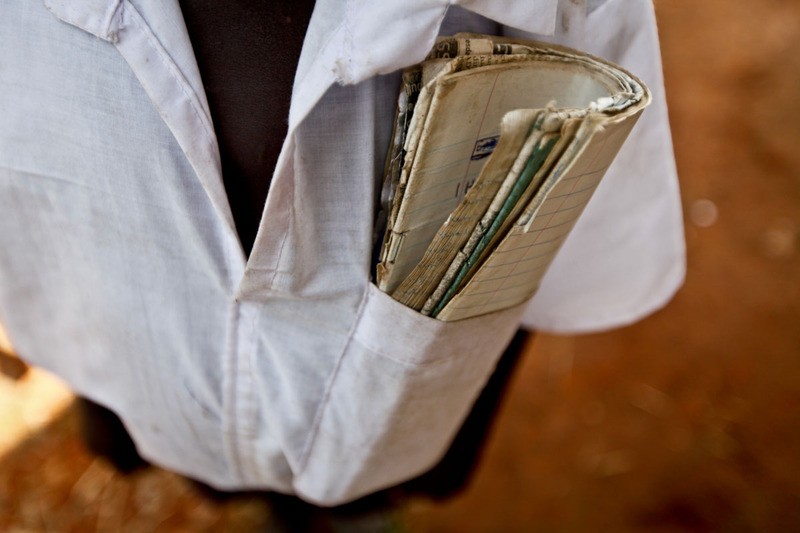 A pupil is seen carrying books in his pocket during a lunch break.Most of them cannot afford backpacks. 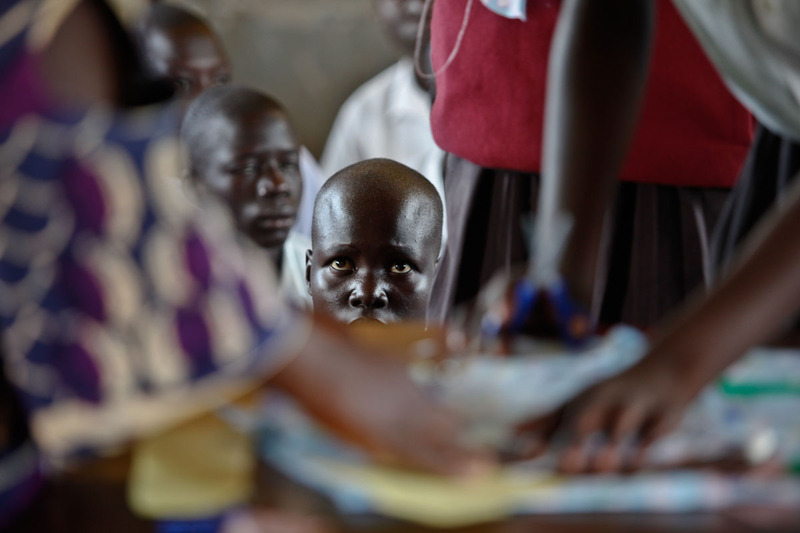 Poverty still bites most of the pupils in the north as families recover from a 20year old LRA war. While high quality pads which cost Ushs. 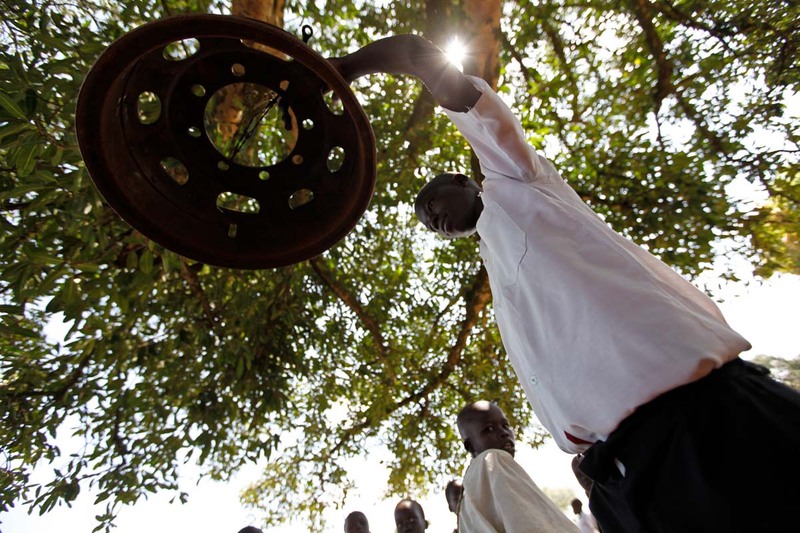 6000 (USD 2.1) are disposed off every time they are removed, those made by Awere can be reused for a period of up to six months. 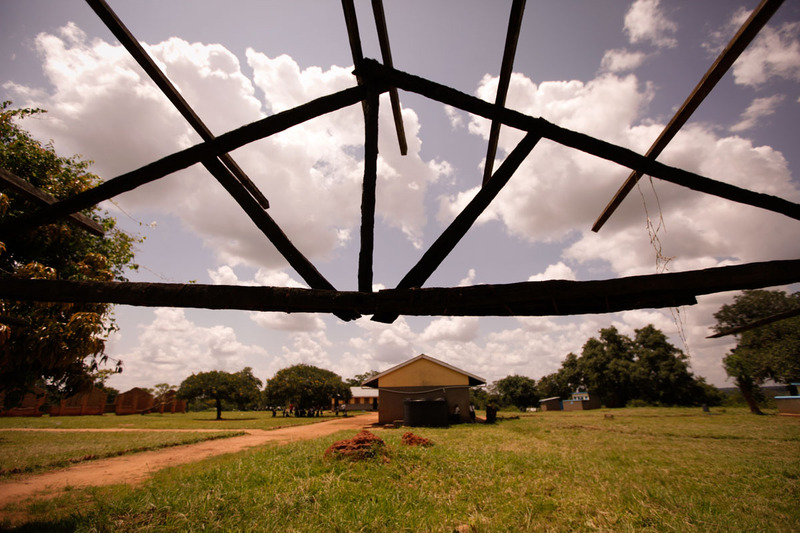 Scars of the 20-year LRA war are still visibly in Awere Primary School seen from this abandoned classroom. Awere Primary school, located 80km northeast of Gulu town started the project of hand making sanitary pads to keep girls at school. For now, Piloya is in school and confident as ever to become a nurse, get married with two children and help take good care of her parents. Moved. Posting this on my fb wall, and that of people I know who could assist keep a project like this one running. The things we take for granted! Days for Girls International tackles this issue worldwide, through a network of volunteers worldwide. They provide washable feminine hygiene kits to women in 18 nations on five continents and growing. They also teach women in impoverished nations how to make their own kits. To join the team, learn more, or request kits, go to http://www.DaysforGirls.org. Again a very important issue.. movingly told. In terms of your photography…brilliant. The 3rd photograph down – of the hand sewing – is exceptional. I am so intrigued by your posts. I think it’s a really wonderful thing that you, a man, have shared this story about a trial of nature that is normally uncomfortable for men and even women to talk about, especially in the open! Thank you. Hello, I am Miho, Japanese. I went to Kenya for two month this year and started TEXTURE PAD PROJECT because I heard that the girls in Africa or developing countries are struggling with lack of sanitary pads. I saw pads with HIV+ women in the community and tried to distribute the pads to a Kenyan public school. I faced a lot of problem. For three weeks I was the only one Mzungu (white people) in the area. Some people cheated me, all of the member asked me money and I could not finish my project there. I would like to see how it is going in the place you took those pictures, and how I can contribute for the HIV women or girls who are suffering from poverty. I want to meet you if I have an opportunity. I’m glad to find out your photography. This is genuinely the first blog post that has made me cry; desperately sad way to start such an important change, as if life isn’t hard enough already – photos are incredibly and words are very moving. Another powerful post. Great, though saddening, images. Great Shots man. Keep Doing what you Do. And i appreciate the kind words too. More especially, taking your time to look through some of my shots! It is amazing how much we in the West simply take for granted. Some of the problems about living in England that I intend to address seem pathetic by comparison to such a basic human need. You are very sensitive to be concerned about how the girls in your country are managing such a personal issue.